Confession: I don’t read much middle-grade. I was one of those kids who jumped straight from classics like Little Women and the Narnia books, into the realm of YA. However, as an adult, I have read a little more middle-grade, and some of them are real gems. 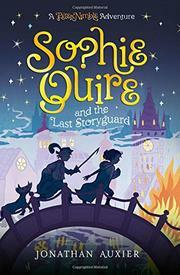 Sophie Quire and the Last Storyguard by Jonathan Auxier is the type of middle-grade novel that makes me wish for a time machine to give the book to my younger self. The characters are so dynamic, and the writing is so lush and vivid, that I read the whole book in one sitting. I, admittedly, didn’t read the first book in this series before, but had no problem catching up. Sophie is brave and bold, and the quest to find the books “Where, What, and When” made me smile long after I closed the book. If you have any young readers in your life, buy this today! Official blurb: It’s been two years since Peter Nimble and Sir Tode rescued the kingdom of HazelPort. In that time, they have traveled far in wide in search of adventure. Now Peter and Sir Tode have been summoned by Professor Cake for a new mission: find a 12-year-old bookmender named Sophie Quire. Sophie knows little beyond the four walls of her father’s bookshop, where she repairs old books and dreams of escaping the confines of her dull life. But when a strange boy and his talking cat/horse companion show up with a rare and mysterious book, she finds herself pulled into an adventure beyond anything she has ever read.